Kiefer: "Smart money should be on General Motors." DETROIT -- A General Motors event here to honor the company's best suppliers broke out into an impromptu sales pitch. New GM purchasing chief Steve Kiefer got on stage during the March 5 ceremony to hand out hardware to 78 suppliers who excelled in quality and innovation in 2014. In the process, he slipped in a few commercial messages, explaining to supplier execs why they should be coming to GM with their best stuff. 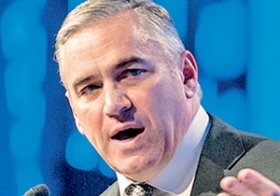 "The smart money should be on General Motors," said Kiefer, who took over as vice president of global purchasing and supply chain in November. He dangled the carrot that GM will be "sourcing hundreds of billions of dollars worth of new business contracts" over the next 18 to 24 months. Kiefer, 51, also asked attendees to send to him, personally, one innovative idea in the next 30 days. "We want to be your OEM of choice," Kiefer said. That the event morphed into a courtship underscores how heavily GM and other automakers are leaning on the supply base for innovation. 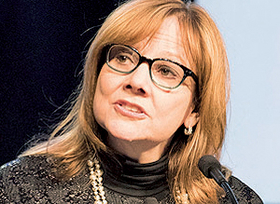 The emergence of autonomous driving, the connected car and mobility services helps explain why GM CEO Mary Barra believes the industry "will experience more dramatic change in the next decade than it has in the past 50 years," as she said during an October speech. "I do have a perception of what all of you may think of General Motors. I had my own perspective as a supplier. Some good, some bad." Barra: GM has been working to give suppliers "a bigger voice." John Henke, president of research firm Planning Perspectives, which conducts an annual survey on supplier relations, says automakers increasingly are vying to become the "preferred customer" for suppliers to float their latest ideas and technologies. "Suppliers are much more willing and able than ever to go with the OEMs with which they have the best relations," Henke says. "And they're not afraid to talk about it." GM ranked sixth out of six large automakers in last year's Planning Perspectives survey. This year's poll, to be released in May, will include more feedback on the suppliers' interaction with individual buyers at the automakers, an area that has been a sore spot for GM. Barra, who joined Kiefer on stage, referenced those tensions and GM's work to ease them. "We've empowered our front-line buyers to remove barriers, to make it easier for you to do business with us," Barra said. GM has been working on "changing the nature of our conversations, being more collaborative, more transparent and giving you a bigger voice in how we operate." Kiefer comes to the job with a view from the other side of the table. Before he was picked to run GM's powertrain division in 2013, he spent 20 years at Delphi Inc., mostly in Europe and Asia. He picks up the mantle of mending supplier relations from Grace Lieblein, who left the purchasing post in November to head GM's quality division. "I do have a perception of what all of you may think of General Motors," Kiefer told the audience. "I had my own perspective as a supplier. Some good, some bad." Jeff Klei, president of the NAFTA region for Continental Automotive and a member of GM's supplier council, said Kiefer wants ideas that run the gamut, from waste reduction and go-to-market strategies to new technologies. "Steve is saying, 'We've tried to change, and now we need you to trust us,'" Klei said. "Only time will tell whether or not suppliers are convinced that GM is the best customer to bring all their best technologies."